There is no better way to get that someone special that gift they are sure to need, show your appreciation to some one who did you a favor, or get that friend a gift for their new home or apartment, and the list goes on, than to get them a Woodstock Hardware Gift Card. 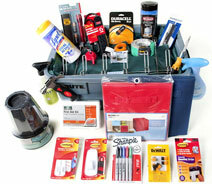 A Woodstock Hardware gift card can be used to purchase over 30,000 products from our store located at 84 Tinker St., Woodstock, New York, 12498, or on our ecommerce site, www.ShopWoodstockHardware.com. 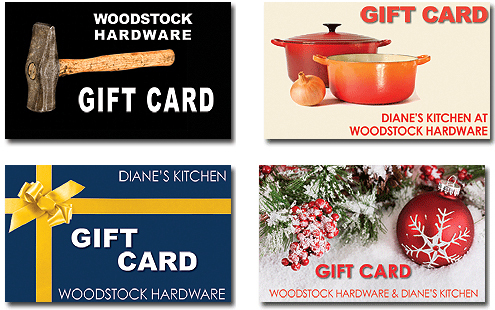 Woodstock Hardware gift cards are available in four different designs and come in any denomination starting at $25. The Gift Cards come in the following design options: holiday, yellow bow, Woodstock Hardware, and Diane’s Kitchen. Another great way to show your love or appreciation to someone is with a Woodstock Hardware Gift Box. Click here to learn more about Woodstock Hardware’s Gift Boxes. These Gift Boxes have been carefully assembled to include the best products to meet a number of specific needs. 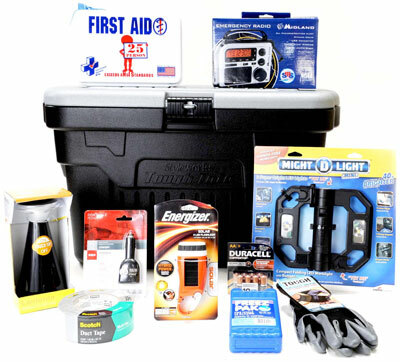 We have Tool Gift Boxes, Dorm Survival Gift Boxes, and Storm Survival Gift Boxes full of the supplies and products anyone needs to tackle that next home repair, move into their first dorm room, or be ready for that next big Winter storm. Of course, we would be happy to add a Woodstock Hardware Gift card to any of these gift boxes extra special. And we are always happy to speak with you about bulk gift card purchases, such as buying for employees, or as contest giveaways during your next marketing extravaganza. To learn more about our Gift Cards & Certificates, either; stop in the store, call us at (845) 679-2862, or Contact Us by email here.